I used to play Pooyan a lot on my Commodore 64, but I never really saw the arcade unit anywhere. Perhaps too many years had passed between its 1982 release and the time you would find me crawling through smoky rooms, playing games. I wish I had played it on a cabinet just once as a child, though. Then I probably would not have gone through life only experiencing the less-defined graphics and had the knowledge that Pooyan was a game about pigs and not cats. 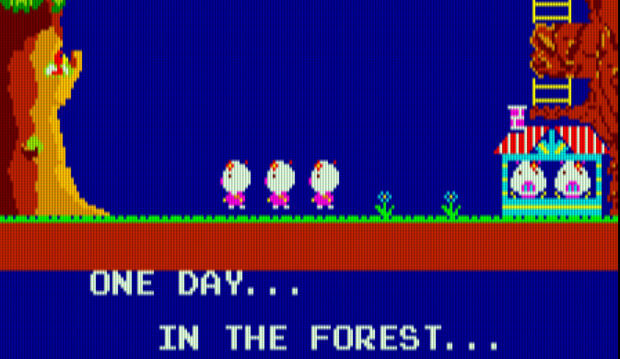 Now that I look at video of the Commodore version... Wow, I was one inattentive child. Those are clearly porkers. What the hell was wrong with me? At any rate, follow along and I'll give you the skinny on an addictive arcade game that you may have missed. The story of Pooyan is a dramatic, epic tale about a mother's love and the lengths that she will go to in exacting vengeance on those who would harm her children. It is very similar to the plot of the 1991 film, Not Without My Daughter, if you replace Sally Field with a pig (natch), Alfred Molina with a wolf (bingo) and you can imagine Iran as being a forest. You control Mama Pig, whose youngin's are being kidnapped by dastardly wolves who have ham dinner in mind. 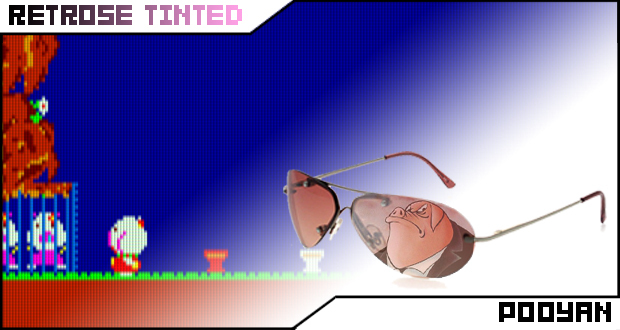 The game has two different levels and a bonus stage, though you're basically doing the same thing in all of them. To defeat the wolves, Mama Pig sits in a bassinet and rains a hellish fire of arrows at wolves. Of course, you can't just shoot the canine foes directly, as that would be violent and bloody. Instead, you're required to take out their means of transportation, balloons. Yes. It is far preferable, infinitely more humane to kill an enemy by giving them the terrifying experience of watching the ground rush up at them while the air moves past their face and they know, that the world is going to end for them. That's way better than killing them quickly with an arrow through the skull. In each level, there are a certain number of wolves who will assault your stronghold, as indicated by a flag at the top of the screen. In the first stage, enemies descend from the treetops. As they drop, they throw rocks at Mama Pig, which will knock her out of the basket if one hits her directly but bounce off if hitting the canopy or bottom. Occasionally, they'll even flip the rope they are clinging to and block an incoming arrow. You also have a special weapon at your disposal: Meat (as a child, I thought it was a fire arrow). At the top of your rope is a piece of meat that will appear, seemingly at random. Collecting this meat will give you one special shot that will descend in an arc and take out any wolves it hits. The more you can tag in a single shot, the greater the amount of bonus points you'll receive. The downside to using it is its indirect path and that it really only separates balloons from their wolves, so the balloons will still be present and could block later, normal arrow shots. If allowed to reach the ground, two things happen. First, they will capture more of your little piggies, which has no real consequence other than a loss of bonus points at the end of the round. Worse, they will occupy spots on the ladder behind you and try for a little bit of rump roast. So, if you fail to hit a few, the game can become even more challenging. Once you've cleared the first stage, you move to the wolves' den. Now that you're on their turf, their defenses ramp up. 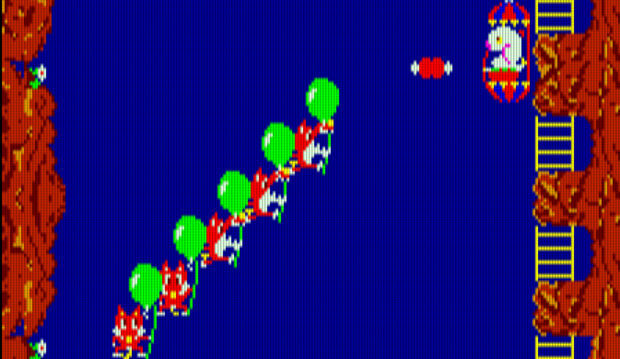 Using their balloon-making machines, they float to the top of the screen where a boulder sits. As wolves succeed in making it past your barrage of arrows, they take places behind the boulder and push it closer to the edge, closer to your doom. To make it a bit more challenging, balloons will just pop up on their own to block shots towards the actually dangerous balloons being held by wolves. When you get as far as the last wolf on this stage, a special "boss" wolf starts its ascent. This one is particularly skilled at blocking shots and it takes as many as half a dozen arrows to bring him down. If you fail and he makes it to the top, five more wolves are added to the level and you'll have to deal with the boss wolf a second time. Upon rescuing your little piggies, you'll get a crack at a bonus round, where you can only fire the meat weapon. You can't fire your normal shots at all, and will have to depend on the meat being available when you want to use it, which isn't really a problem as it pops back up quickly. Just as in the second stage, the wolves are floating up and you have to nail as many as you can with each shot of meat. A bonus is calculated at the end of the round based on how many wolves had to die and the amount of meat you had to use to kill them. And that's pretty much all there is to it. So, why can't I stop playing? I wish I knew. The game is simple, which is an aspect of games that I really like because it lends itself to being addictive. It's also surprisingly tough to be good at, and I find myself struggling to make it past the fifth stage. As stages get more difficult, they add more things to block your attacks and balloons become more resiliant, deflating as they are shot. This is one of those games that I never expect to actually see a cabinet of ever. It's a little too old and a little too strange. And, according to Wikipedia, American audiences did not respond well to the game based upon its name (which, in Japanese, means "little pig" or -- very rarely -- as an adjective meaning "extremely stupid"), probably because it has "poo" in it. 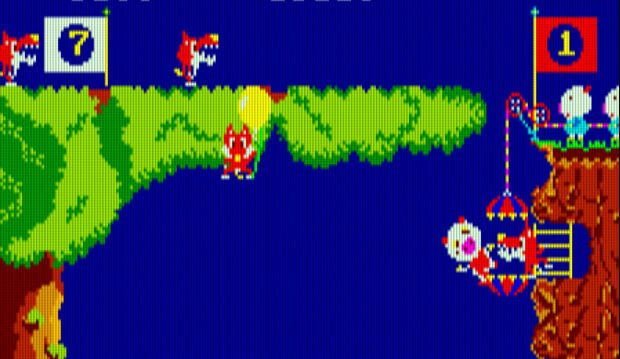 The Japanese got a Virtual Console release of the Famicom port some time ago, so it's possible that we could see Pooyan on Wii in the future. I'm not holding my breath. I'll just have to be content playing the game that I have. Over and over again.